June has been a time for gatherings, new beginnings, a time of celebration. On June 15th at 10 am, friends, colleagues, family and a livestream audience joined together in the Salon for the announcement of Kevin Loring as the first AD. This was a culmination of work carried out by so many of you. It was an exciting day! Mr. Loring is an accomplished Canadian playwright, actor and teacher, and was the winner of the Governor General’s Award for English Language Drama for his outstanding play, Where the Blood Mixes in 2009. The play explores the intergenerational effects of the residential school system. It toured nationally and was presented at the National Arts Centre in 2010, when Mr. Loring was serving as the NAC’s Playwright in Residence. 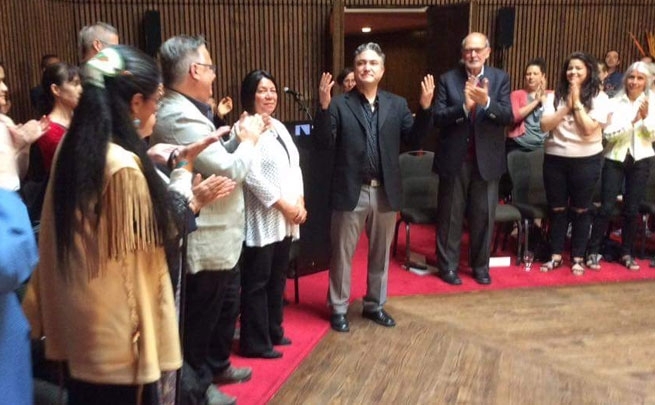 On Thursday, June 15th the National Arts Centre proudly announced the new Artistic Director for Indigenous Theatre. A Nlaka’pamux from the Lytton First Nation in British Columbia, Loring created the Songs of the Land project in 2012 in partnership with five separate organizations in his home community. The project explores 100-year-old audio recordings of songs and stories of the Nlaka’pamux People. Loring has written two new plays based on his work with the community including Battle of the Birds, about domestic violence and power abuse, and The Boy Who Was Abandoned, about youth and elder neglect. A versatile artist and leader Loring has served as the co-curator of the Talking Stick Festival, as Artist in Residence at the Vancouver Playhouse Theatre, as Artistic Director of the Savage Society in Vancouver, as a Documentary Producer of Canyon War: The Untold Story, and as the Project Leader/Creator, and Director of the Songs of the Land project in his home community of Lytton First Nation. This one of kind event took place at the NAC’s Salon on the afternoon of June 15 and the morning of June 16th. Produced in collaboration with Canada Scene, curator Lindsay Lachance, Brittany Ryan, Lesley Parlane and Sarah Garton Stanley worked together to bring over 40 participants to spend time in the company of leaders from across turtle Island. It was so cool! 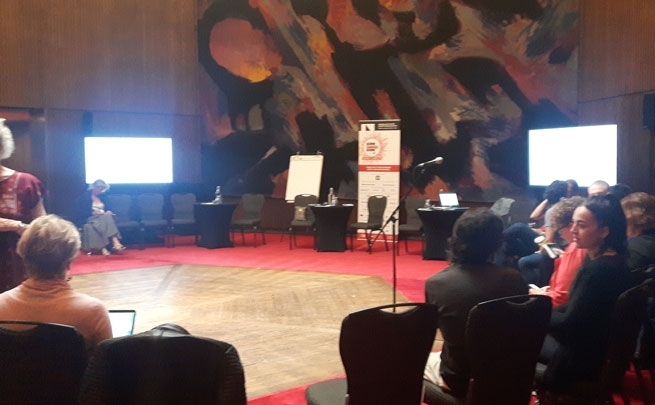 The gathering began by introducing the Conversation Leaders’ connection to Indigenous Theatre. In depth discussions took place about performance analysis tools that support the viewing, reception, and teaching of theatrical works. These discussions provided an opportunity to dig deeper into the questions and themes presented by the Conversation Leaders; Muriel Miguel, Monique Mojica, Margo Kane, Jill Carter, Sylvia Cloutier and curated by Lindsay Lachance. 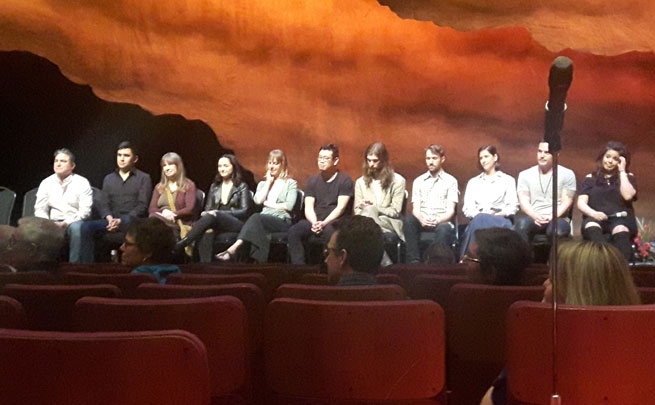 After viewing Corey Payette’s Children of God the participants had an opportunity to stay after the show for a Talkback Session with cast members, led by Kim Harvey who placed Truth and Reconciliation and the calls to action at the centre of her facilitation. On Friday morning the Gathering participants came to discuss and articulate their reactions to the previous night’s performance and broadened their response into possible tools for mobilizing more critical and thoughtful ways to experience, remember, and activate performance. First Scene: Throughout the week beginning on June 15th and concluding June 21st, Denise Bolduc, in collaboration with Canada Scene created a First Scene beginning to the Scene. During this time Louis Riel, Cafe Daughter, Children of God and Making Treaty 7 played on three of the NAC stages. There were Indigenous presenters from across Turtle Island and beyond in attendance and a series of panel discussions surrounding questions of appropriation and ownership in Louis Riel were also held. 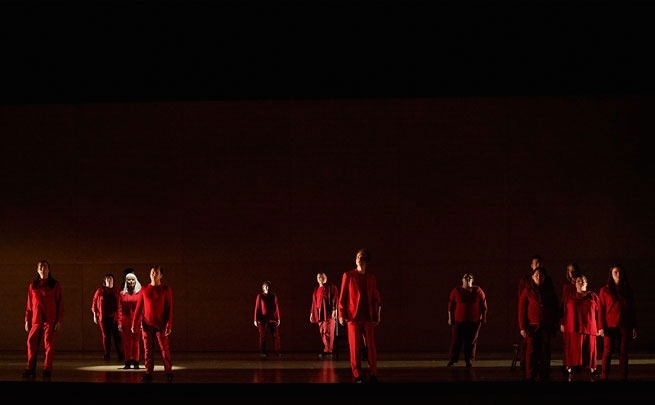 Four Nations Exchange, an initiative led by Suzanne Keeptwo, and begun when Peter Hinton directed King Lear, were brought back together as the Land Assembly, a silent chorus composed of Métis and First Nations performers who witnessed and responded to events in the opera. Peter Hinton’s production critically assesses our cultural and artistic past from the perspective of those who have previously gone unheard, with Métis and Indigenous counsel and sensibility touching every aspect of the production. Jani Lauzon. Billy Merasty, Cole Alvis and Justin Manyfingers were featured performers in the show, each of them traveling from the Canadian Opera Company premiere to the presentations in Ottawa. Following a beautiful land acknowledgement given by one of the company members, Nisga’a dance group leaders Goothl Ts’imilx Mike Dangeli and Wal’aks Keane Tait and their dance company opened the show. The National Arts Centre in preparation for marking the opening of the newly renovated building on July 1, 2017 plans to start things off in a good way, with a special smudging ceremony to be conducted by Algonquin Elder, Annie Smith-St. Georges and newly appointed Artistic Director Kevin Loring will say a few words on behalf of Indigenous Theatre. Kevin officially begins his new job as Artistic Director on October 16, 2017. Canada Scene is still going strong with a steady stream of ongoing performances from June 15 – July 23. Indigenous Artist’s are in the spotlight as many performers take to the stage; Buffy Sainte-Marie with special guests: Randy Bachman and DJ Shub and later in July, Anishinabewke performs with ShoShona Kish, Tanya Tagak, and Amanda Rheaume. This marks the end of the newsletters tracing the steps to the naming of the first Artistic Director of Indigenous Theatre. We want to thank-you for reading, and for participating in all of the many and varied ways that each of you have throughout this momentous time. Stay tuned for all that is to come. Chi Meegwetch, Marsee, Qujannamiik, Merci, Thank-you.